Paytm Mall is hosting a Maha Cashback Sale from October 9 to October 15. The platform is offering a pretty good discount and impressive cashback on a wide range of products that include smartphones, large appliances, laptops and more. 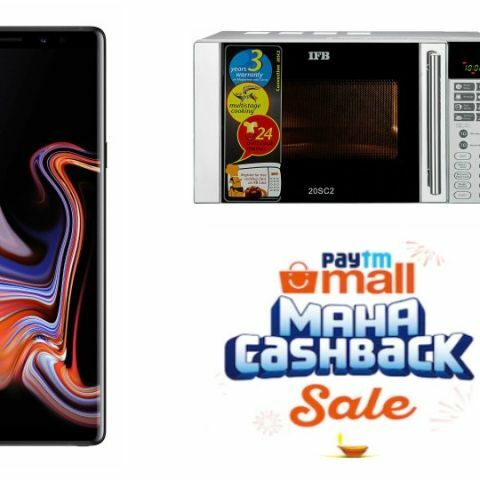 Paytm Maha Cashback Sale starts today and will run until October 15. The platform has a plenty of amazing cashback deals on a variety of products. On this Maha Cashback Sale, the platform is also giving away up to a 10% additional discount to those who will pay using ICICI bank debit/credit card. Here take a look at the best deals Paytm Mall has on day one of the sale. Oppo's current flagship smartphone, the Oppo F9 Pro, wll be available for as low as Rs 16,000 when you take into account the additional cashback, exchange and offers. The phone sports a 'waterdrop notch' and sports a dual-rear camera setup. Click here to buy. The Whirlpool 7Kg Semi-Automatic Top Load Washing Machine comes with a 6th Sense Tumble care technology, that removes even the toughest stains from your clothes easily. The machine is now available on the sale for Rs 7,394. Click here to buy. If you’re a fan of Apple products and thinking of purchasing an Apple machine for your home or workplace then this might be the right time to grab your favorite gadget. The Apple iMac is powered by the latest 8th Gen Intel Core i5 processor. The machine packs an 8GB DDR4 RAM and 1TB hard drive. Click here to buy.